Ludwig Bemelmans (born Meran, Austria, 1898; died New York, New York, October 1, 1962) was an author and illustrator. He came to the United States in 1914 and found work as a busboy. Later he wrote books for an adult audience. However, he is most known for his children’s books, including the six Madeline books and all the further adventures of the little girl. In total he published about 46 books. His grandson, John Bemelmans-Marciano, has written five more Madeline books. Children could learn more at: Bemelmans. John Burningham (born Farnham, United Kingdom, 1936; died London, United Kingdom, January 4 , 2019) wrote and illustrated books for children. Two of his books received the Kate Greenaway Medal. Borka: The Adventures of a Goose with No Feathers earned the 1963 medal, and Mr. Grumpy’s Outing received the 1970 medal. He wrote There’s Going to Be a New Baby in 2011, and his wife Helen Oxenbury illustrated the book. 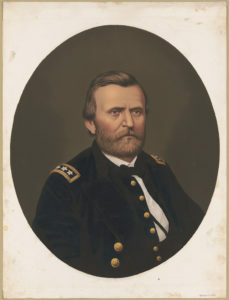 Ulysses Simpson Grant (born Point Pleasant, Ohio, 1822; died Mt. McGregor, New York, July 23, 1885) was the eighteenth president (1869-1877) of the United States. Children could visit a website at: Grant. Idea: Grant was a famous Civil War general. Lee surrendered to him at Appomattox, Virginia, to end the war. Children could find out which other presidents were also military leaders. They could then decide whether a military leader made a good president. Coretta Scott King (born Marion, Alabama, 1927; died Rosarito Beach, Mexico, January 30, 2006) was a speaker and writer. The widow of Martin Luther King, Jr., she continued the work of the civil rights movement. Children could read Coretta Scott King by Stephanie Sammertino McPherson. The Coretta Scott King Book Awards honor the finest African American children’s book writers and illustrators. Children could learn more at: http://www.ala.org/emiert/cskbookawards. They could also read the chapter devoted to Coretta Scott King and the Coretta Scott King Awards in Children’s Book Award Handbook by Diana F. Marks. Samuel Finley Breese Morse (born Charlestown, Massachusetts, 1791; died New York, New York, April 2, 1872) was an inventor and an artist. He invented Morse code, and his first transmission, made on May 24, 1844, was, “What hath God wrought?” Idea: Children could learn about Morse code and send messages to each other. Children can learn more about Morse Code at: https://www.nsa.gov/kids/games/gameMorse.swf. Nancy Shaw (born Pittsburgh, Pennsylvania, 1946) writes books for children. Her works include the Sheep series and Elena’s Story. Children can visit her site at: Nancy Shaw.